Ten years later we had some time left in Indonesia after our expedition to Papua and my curiosity started to win. 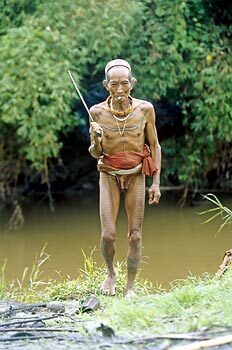 I thought that it would be interesting to find out how the Mentawai culture was doing. I wanted to know if anything could be left after twenty years of exposure to mass tourism. Because Siberut has been such a popular destination for so long, with huge numbers of tourists coming to see the ’primitive people’, I definitely did not want to be any part of it. And so I was looking for another way. I needed to find an interpreter knowledgeable of the Mentawai culture. In the end I found a guide who had been recommended to me by a well-known photographer, and we set off for Siberut. It turned out to be a mistake after all. The times had changed since the photographer's visit. We planned to go as far as possible from the usual tourist places, to be able to learn something about the life in Siberut's rain-forest. We were promised we would travel by a motorised canoe far into the interior, and then walk for another five hours from the river. That seemed like a sufficient distance on such a small island. In general, those few days with the Mentawai were very interesting and we learnt a lot about their culture – the original one, as well as the new (modern) one. 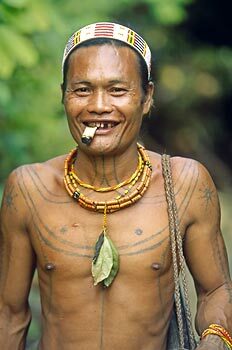 The Mentawai are very nice people with a deep sense of justice and friendship. They also told us how the Indonesian government is trying to get them to sell their forests for logging, something they are fiercely opposing. They understand how important it is to preserve their environment for future generations. That made me really happy. Our guide did not keep his promises and took us only to the usual tourist place, but he looked after us very well and was keen to explain as much as he could. We did not find what we were looking for, but at least I have an extra reason to come back.